Would he recognize her? Would she recognize him? What would he say to the woman who, three decades ago, thrust a few days' supply of ground peanut and corn snacks into his hands and sent him and his older cousins into uncertain fate? On Sunday, Abraham But saw his mother for the first time in 30 years. 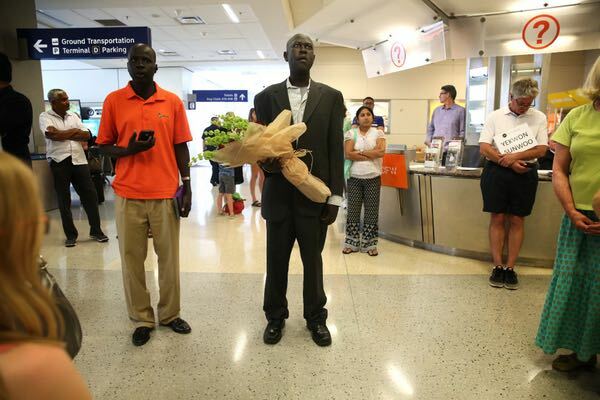 He and several cousins, who now live in North Dallas, were among about 20,000 "Lost Boys of Sudan" forced to flee as the Second Sudanese Civil War raged between 1983 and 2005, claiming But's father and 40 members of his extended family. For nearly three hours, But waited for his mother at the international arrivals gate at DFW International Airport. "I don't know if she will remember," he said softly. He had put on a dark-colored suit and a striped shirt just for her. A young immigration officer in his navy uniform escorted her out the gate. Nyak Marol Kur looked disoriented as the officer tentatively pointed to the group of men waiting with But. Abraham But (center) waits at the international arrivals gate with his cousin Philip Machok for his mother, Nyak Marol Kur. His lost years were initially filled with turmoil and uncertainty as the boys traveled, mostly on foot, from refugee camp to refugee camp, fleeing bombs, bullets, thirst and disease. Their journey took them from Sudan to Ethiopia, back to Sudan and then to Kenya. They finally came to the United States in 2001. It was five more years before But, who graduated from Hillcrest High School in 2004, would be in touch with his mother again, only by phone — and unlike his cousins he has not seen any of the family he left behind since he left in 1987, in big part due to his worsening health issues. At the airport, But moved to greet his mother with a bouquet of roses and sunflowers that he and his cousin had bought at Central Market. She held her hands up to her face and stepped back. Her sparkly blue earrings dangled as she prayed, three decades of separation hanging between her and her son. But and his cousins had grown up in Jalle, a village 40 miles from the town of Bor, in southern Sudan. The conflict between north and south Sudan had been roiling for four years and by 1987 had spilled into Bor and the surrounding area. "That's how I left," But said. "Because of the war. There was fighting. People dead." Many children, a number of them orphaned, headed toward the Ethiopian border. Not all made it. Young Abraham, only 3 or 4, prepared to flee with a group of boys, including a number of older cousins - among them Peter Thiong, Philip Machok and Philip Ayuen. His mother handed him a Sudanese mix of pulverized peanuts and corn. "I was sad," he said. "I was very small." The journey took 30 days on foot and was not without dangers. "We had to cut through a lot of things, including a village that was known for child abduction," Thiong said. "We were crossing rivers and forest. It was a little bit scary." They traveled at night to avoid aerial bombardment and the daytime heat. Water was scarce, and they would sometimes go half a day without a drink. Diseases spread among the displaced youngsters — measles, malaria, tuberculosis. "Some of the group lost their lives on the way," But said. The effects intensified once they reached Ethiopia's Pinyudo refugee camp, where latrines were in short supply. They spent three and a half years there - until unrest in that country led to the government's overthrow in May 1991 and camp refugees scurrying once again. The boys scrambled back toward the border, having heard that a group of refugees that had returned before them had come under attack by the Sudanese military. They crossed the Gilo River, which later would be the site of many deaths as other refugees attempted to flee, chased by Ethiopian rebel forces. "People drowned in the river," said Ayuen, now a medical technician at an assisted living facility in Dallas. "That came later." Many refugees settled in at Pashala — not so much a refugee camp as a desperate gathering of displaced people, just inside the Ethiopian border near Boma National Park. Eventually the bombing would start again, and they continued south, first to Kapeota, then to Narus. They'd try to send letters home via the Red Cross workers they occasionally encountered, never knowing whether they arrived. Months, or even years, would go by before they'd hear news of major events.Narus was where But, now 7 or 8, learned that his father had been killed in the war several months earlier. It was impossible to return home; rebel forces had split among themselves and led to chaos in the south, including the September 1991 Bor massacre, in which 2,000 civilians were slaughtered. "The area most affected was our hometown," said Thiong, a financial analyst. "We couldn't go back there; it was too dangerous." They continued toward Kenya, using strategies they had learned to take care of one another, especially the younger boys: Forming a line. Taking a head count before they left, and another when they arrived. "They would look after me and make sure I was not far behind," But said. Ayuen remembers traveling with But and a younger brother and cousin, trying to keep warm as they slept. "Me and another guy used to put them between us and cover them with our clothes when it was cold," he said. In June 1992, the boys reached Kenya's Kakuma refugee camp, where they would spend the next nine years. As in Ethiopia, they continued their schooling in makeshift outdoor classrooms under trees, harassed by blowing dust. Abraham But and his cousins were the first Lost Boys to arrive in Dallas-Fort Worth, they say, when they came to the U.S. in 2001. But was 17 at the time. After graduating from Hillcrest, But chose to work, hoping to earn money to help his mother and siblings back home — first as a salesperson at Home Depot, then at a school cafeteria in Lousiana. That was where his health issues began. He suffered two strokes in 2011, and his cousins brought him back to Dallas. He now lives in a modest Lake Highlands apartment with cousin Machok and hasn't worked since, his troubles compounded by failing kidneys. Earlier this year, he started making plans to visit his mother in Kenya, where she lives now. But the latest medical tests showed that his kidney issues had worsened: They were operating at only 5 percent capacity. "We talked to the doctor and he said the changes were not good for him to go," Machok said. 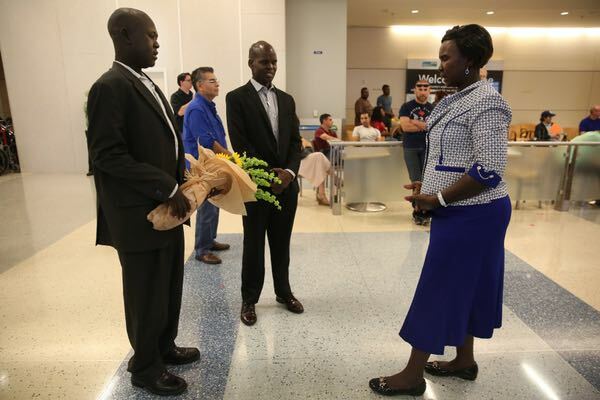 Abraham But (far left) and his cousin Philip Ayuen (center) pause to pray with But's mother Nyak Marol Kur upon seeing her for the first time in 30 years at DFW International Airport. With the area still facing instability and minimal medical care, "for someone who is not well, it's not a good idea to go," said Machok, a pharmacy technician. "It was better for his mother to come see him." The circumstances aren't ideal, Thiong admitted. What should be a mother-son reunion untarnished by other concerns will be, in effect, a mother coming to visit her sick son. Still, "for him to see his mom will be a sign that his family is still there," he said. "That he still has a chance to see them again." When the prayer at the airport was over, But moved closer and offered his hand. His mother grabbed it and pulled him into an embrace.